OK, I admit this is not a real biriani but it has elements which are pretty similar. 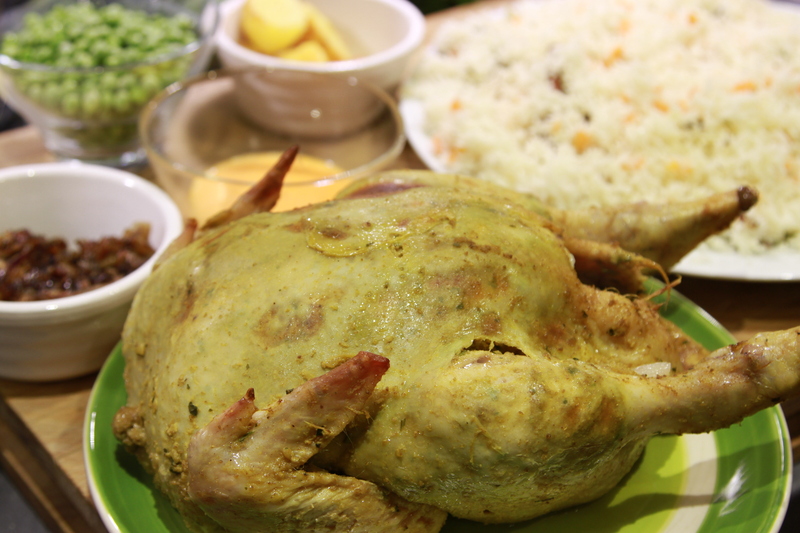 The dish is essentially a whole marinaded chicken which is partly roasted. It is laid on top of a rich lamb curry sauce with par-boiled rice layered beneath it and around it. The whole thing then finishes cooking in the oven. It involves the use of a chicken brick (a clay pot with a clay lid) but a well proportioned casserole with a lid would work! The dish takes time to make and has a number of stages but no single stage is particularly tricky. I love this sort of “total immersion” cooking and luckily my 17 month old is keen to get involved and doesn’t get too bored with it as long has he’s included!! Having participated in the cooking, he’s only too happy to partake in the eating! As a result there’s plenty of flavour but no chilli in this dish. Feel free to add chilli if you want though. I would suggest adding chilli powder to the masala spices. 3 cups of Basmati rice – wash well and soak for 3-4 hrs, changing the water every 30mins or so. Finely chop 3 onions in a food processor and fry in a decent glug of vegetable oil for about 15mins over a medium heat until they soften and begin to colour. 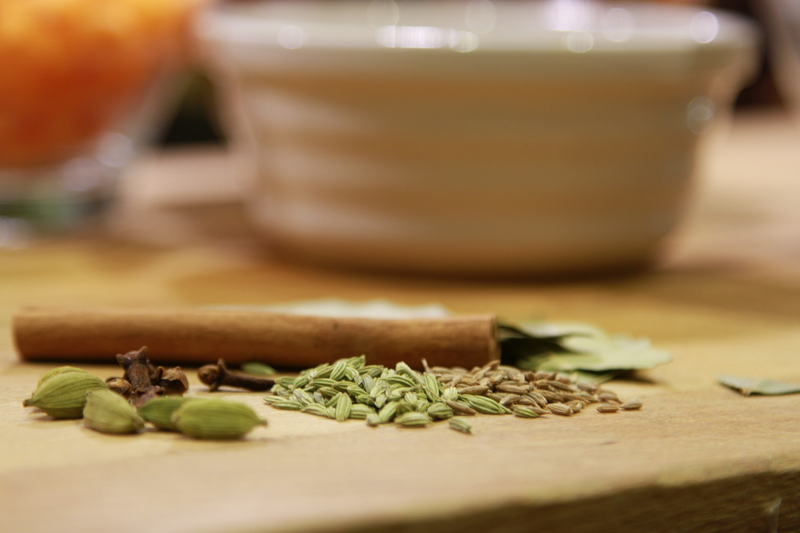 While that’s happening, make the masala by dry roasting the spices until fragrant then blitz to a fine powder in a spice/ coffee grinder or by hand in a pestle and mortar. Add the tumeric, garlic and ginger powder and salt and mix well. Add the masala powder to the onions and add a little bit of hot water, the onions should pretty much disintegrate into the liquid to form a thick paste. Continue to fry the paste for a couple of minutes more until the oil just begins to separate out of the paste. 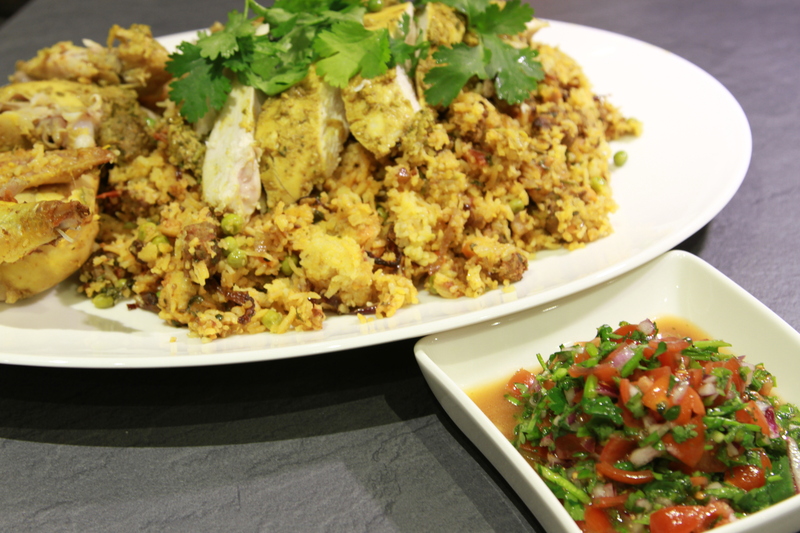 Remove from the heat and add a handful of finely chopped coriander – allow to cool. Add 3 tablespoons of the masala paste to the yoghurt along with a handful of chopped coriander and a tablespoon of chopped mint. Rub well into the chicken, put about half of it under the skin of the bird by sliding your fingers between the skin and the flesh to create a pocket. Squish the marinade all over the underside of the skin. Leave wrapped overnight in the fridge. Take a tablespoon of the masala paste and mix with the raw mince lamb, add a small handful of chopped coriander and a tablespoon of chopped mint. Mix it well and wrap and refrigerate overnight. Peel and parboil the potatoes until they are soft but not quite mash. Carefully remove from the water and allow the steam to escape by laying them flat on a roasting tray in a single layer. Coat them liberally in vegetable oil and roast them for about 1 hr at 180c to crisp the outside (like a roast potato). Set them aside when they are done. My mum deep fries the potatoes after they have dried a little after par-boiling, but I’ve tried to cut down the deep frying!! As soon as the potatoes are in, rub a generous amount of ghee (clarified butter) all over the base part of the chicken brick and place the marinaded chicken into it. Pop in the oven with a temperature probe in the thickest part of the thigh and roast until the temperature registers 63c – takes about 1.5hrs at 180c. While the chicken and potatoes are roasting; fry the sliced onions in a medium/low heat in some vegetable oil, for about 20mins, until brown and caramelised all over. Set aside. Fry the cinnamon sticks, cardamon pods, cloves and bay leaves in a tablespoon of ghee in a large pan. Add the uncooked and drained rice. Stir it, to coat the rice in the flavoured ghee. Add boiling water and par-boil the rice, for about 8mins, on a low simmer. The rice should have lost it’s raw translucency but still retain a bite. Drain the water out using a fine colander and allow the rice and the spices to cool on a tray to allow the steam to escape. Set aside. Shape the mice lamb balls into small, bite-sized balls and fry them in a hot, dry, heavy based frying pan (the fat rendered from the lamb will be plenty, no need to add any oil). When they are coloured all over, add the last tablespoon of the masala paste to the pan and fry it for a few minutes, allowing it to coat the meat balls. Add the tin of chopped tomatoes and stir this in well. Allow the sauce to reduce to a thick paste and remove from the heat. Stir in a handful of chopped coriander and set aside. Gently heat 2 tablespoons of milk and add two pinches of saffron to the milk. Allow 10mins for this to infuse and stir well. Add the saffron milk to a tablespoon of rosewater and a tablespoon of double cream and stir well. Set aside. When the chicken has reached 63c, remove the brick from the oven and remove the lid. 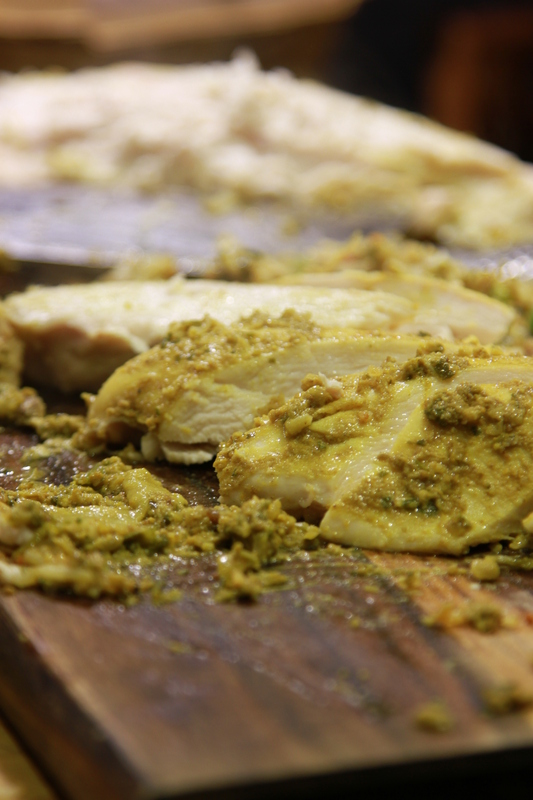 Carefully remove the chicken from the brick and set a aside on a deep plate or tray. Pour the remaining chicken juices from the brick into a small saucepan and reduce it down by half over a medium to high heat. Add this to the meat balls in the tomato sauce and mix in gently. Line the base of the pan with the lamb balls in the tomato sauce. Scatter a layer of rice over the lamb and place the chicken over it then add a layer of potatoes, more rice, then the peas and more rice. Continue to pack the rice around the chicken and on top of it. Spoon the saffron sauce over the rice in discrete patches. The aim to have some of the rice stained with the saffron and some pure white. Layer the caramelised onions over the top and replace the chicken brick lid. Replace in the oven at about 180c again and cook for 45-60min. Have on the table already, a wooden carving board or chopping board big enough for the chicken. A large dish for the rice and a carving knife and serving spoon. Take the chicken brick to the table and remove the top. Carefully begin to spoon the rice from the top and sides of the chicken into the serving dish. When enough rice has been removed, you will be able to lift the chicken out of the brick onto the wooden board for carving. Carve the chicken however you like. I like to take off the brown meat and the breasts then slice the breast into thick slices. The bones should easily pull away form the thigh and legs allowing you slice (or shred) the brown meat. Spoon the rest of the rice and the lamb from the brick into the serving dish. 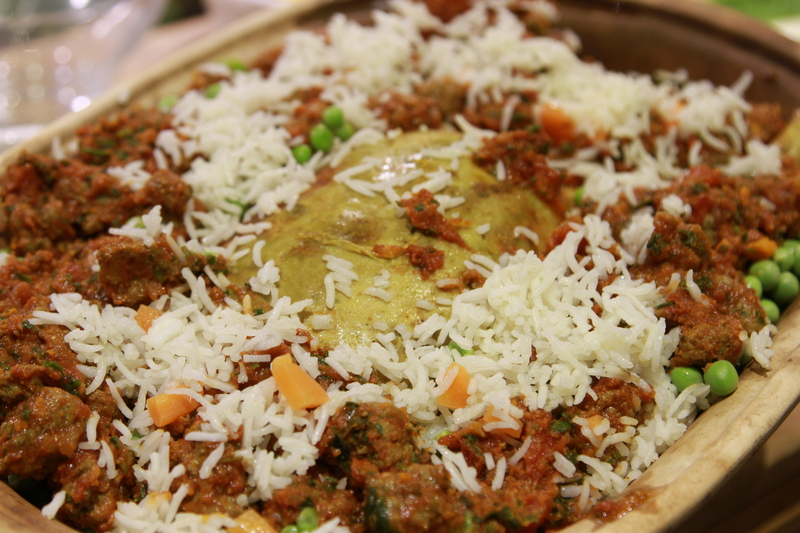 Very carefully and delicately mix the rice and lamb in the dish together so that the rice from the top and the bottom and the lamb are all mixed up. Serve each person some rice and some white and brown meat. Serve with fresh tomato chutney. Thank you. It takes a bit of time to do but I hope u find its worth it if u decide to give it a go!